Vaccinations protect you from specific diseases that can make you very sick, disable or even kill you. They boost your body's own defence system, which is also called the immune system. Vaccines create immunity that protects you from an infection without causing the suffering of the disease itself. 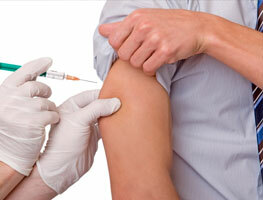 Sometimes vaccines are called immunizations, needles or shots. Vaccinations are a fantastic way of protecting your body against disease. Vaccinations protect you, your child and the community from infectious diseases, such as polio and whooping cough (pertussis).